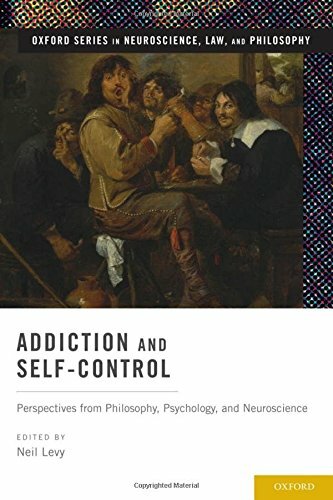 This collection of 12 papers by philosophers and psychologists has important contributions to the field of addiction studies, mainly addressing the question of whether addicts have the ability to control their own behavior. It overlaps with moral philosophy, with some papers also addressing whether addicts should be blamed when their addictive behavior leads to the harm of others. There are a couple of papers on Ainslie's picoeconomic approach to understanding gambling addiction, which sees the irrationality of addictive behavior largely as a matter of hyperbolic discounting of our preferences, which leads people to more motivated to satisfy immediate desires rather than those that would be better for their long term future. It is quite an intricate theory and Ainslie does some summarizing of it, adding plenty of refinements. It is a theory that is not tied to a neurological or biological approach to understanding behavior, so it makes no assumption that addictive behavior has to be based in particular brain mechanisms, and thus is well placed to give an account of gambling addiction. Don Ross supplements the approach by discussing how it fits with a neurological approach to gambling behavior. He describes Ainslie's approach as mentalistic and argues that gambling behavior provides a helpful case study of how the mentalistic approach can complement the neuroscientific one. His point is that the mentalistic approach cannot be reduced to neurological terms, but Ainslie's theory should not be seen as competing with a neuroscientific theory. He argues that a satisfactory approach to addiction can combine explanations at different levels and that the two aspects of explanation can help each other. Natalie Gold, a philosopher, takes a very different approach, bringing in an approach that goes back to Aristotle to practical reasoning to understanding addiction, but using theoretical resources that are very modern. She draws on models of interpersonal reasoning and the self as a team of agents rather than a singular agent to explain cases of weakness of will, where a person acts against what they value most. This is part of a larger research project on understanding human irrationality and mental disorder in terms of seeing a person as a team -- see Gold's list of recent publications. Unfortunately, it a very schematic approach and it is difficult to evaluate its strengths on the basis of just one paper. Owen Flanagan contributes a paper on a theme he has addressed several times, first person accounts of addiction and their philosophical importance. He talks about some of the debate about whether alcoholism is a disease, and the role that Alcoholics Anonymous can play in helping people who want to drink too much. He explains how much of the credo of AA is hard to make sense of or is just wrong, but argues that AA may be helpful anyway, and gives some speculation for how that could be so, and how it could be explained. It is a rather basic exposition of issues but it could be useful to people trying to make sense of AA. Mark Walton and Nicholas Nasrallah are psychologists who take a neurological perspective on addiction. They address the literature on the neuroscience of normal self-control, valuation, and rule-guided behavior sheds light on addiction. Their main conclusions are that this is a complicated issue and simple generalizations about the nature of addiction are implausible. They also claim that while the "neural circuits" for valuation are corrupted in addiction, those of "rule based decision-making" are not. Walter Sinnott-Armstrong argues that responsibility for behavior is not all-or-nothing, but instead comes in degrees. We can be more or less responsible for what we do. He points out that addiction comes in many forms, and so instead of asking whether addicts are responsible, we should ask to what extent they are responsible. He examines various accounts of self-control and shows how they allow for various different kinds of failure of self-control. He does not say much about how to tell how much self-control and responsibility a person has in any particular situation, but his general point is very plausible. Jeanette Kennett builds on work by Neil Levy about self-control -- or maybe her proposal is better seen as a corrective. Levy uses the dual system model of human reasoning, which distinguishes between fast automatic brain processes (system 1) and slow reflective processes (system 2). System 2 processes can fail when they are over-taxed or impaired, and then people are more likely to act on impulse and follow their cravings. She argued that many addicts may lack the right sort of self-image or self-confidence, and some addicts are just resigned to their situation, and give up on themselves. While the central idea about the ways that people can become addicted is not new, it is a salutary reminder that simply focusing on brain processes is not going to provide a complete understanding of addiction. Hanna Pickard (a philosopher and therapist) and Steve Pearce (a psychiatrist) consider the responsibility of addicts who also have personality disorders. Reviewing clinical experience treating this population, they argue against the claim that these addicts have no control of their behavior. They emphasize that common portrayals of this population as are mistaken, and that there is more truth to plausible psychological explanations of addictive behavior such as that people use drugs to numb themselves and avoid feeling pain. They take the same view as Sinnott-Armstrong that choice and control come in degrees, and argue that the aim of the clinician is to enhance the agency of the addict. They argue in favor of quite traditional psychological explanations of addictive behavior, citing five factors: strong and habitual desire, willpower, motivation, functional role, and finally, decision and resolve. They finish by arguing that when addicts face negative consequences for their addictive behavior, they will have more motivation to avoid that behavior, so punishment for addiction can help deter addictive behavior. Thus, punishment can have a role in treatment of addiction. As with much of Pickard's work, it is an extremely plausible account, defended well , taking account of the current literature. Gideon Yaffe, a philosopher, takes a more technical approach, asking is addicts are akratic. He engages with the philosophical work of Richard Holton and Timothy Schroeder on valuing and desiring. After some complex discussion, he comes to the conclusion that we can both resent an addict for hurting people and also treat them more sympathetically than a non-addict for similar behavior, because addiction makes their lives more difficult. One wonders whether he could have come to the same conclusion without having to engage in the dense philosophical discussion. Timothy Schroeder and Nomy Arpaly, both philosophers, directly consider blame and addiction. They start with the provocative view that Arpaly has defended at length previously, that it is irrelevant whether an addict acts autonomously -- an addict is blameworthy if they act will ill-will or malice, or are negligent due to a lack of concern for others when they have a duty to those people. They then review the scientific literature and conclude that there are genuine differences between addicts and non-addicts. They examine a particular case of an action described by David Carr, when he neglected his young daughters in order to obtain and take drugs. The question is how blameworthy he was for putting his daughters in danger. They conclude that he didn't have malice, and his desire for drugs was somehow external to his morality. Their conclusion is similar to that of Yaffe, and say that Carr was no less loving than any other regular parent, because his impulses or cravings for drugs do not reflect his desires or values. The authors base their account of this view largely on the science of addiction, which makes sense, but it takes more than that to establish it, and presumably it requires an account of what values and desires are. So maybe the kind of detailed philosophical argument provided by Yaffe is indeed necessary. The authors provided their own account of desire in their book In Praise of Desire, published the same year as the volume under review. The final article in this collection is by Richard Holton, a philosopher, and Kent Berridge, a neuroscientist. They explain that their proposal for understanding addiction is aimed to be a middle path between the extremes of the disease addiction model which leaves no room for choice, and the free choice model, which leaves no room for a lack of choice. They describe addiction as a malfunction of the wanting system, but they argue that this does not result in a complete loss of agency, because addicts still have some control over which desires they act on. The authors don't address the question of responsibility or blameworthiness directly, and it isn't entirely clear what the implications of their view are.